The Margulies are descended from the Margolioths, a line of distinguished rabbis and scholars. Margolioth is a family name that originates from the Hebrew word marga-li-th (margolis), marga-li-yôth (pl.)" , which means "pearl". 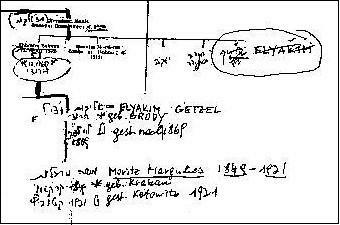 Variants are: Margolis, Margulis, Margules, Margoliouth, Margoliut(h), Margo, Margolin, Margolinski, Margolinsky, etc. When Heinrich Margulies emigrated to Palestine, he changed his name back to the hebrew form Margalit. Various family names of same meaning are Perlman, Perelman, Perlstein, Perlmutter, Perelmuth, etc. It has been said that the Margolioths can trace their ancestry back to Rashi (Rabbi Shlomo ben Yitskhak, 1040-1105). (See Legends: Habsburg, Shmabsburg ! King David Rules, OK ! ) Whether this is true, is open to conjecture, but the descent back to Samuel Margolioth, dayyan (rabbinical judge) at Posen about 1550, can be seen in the " Jewish Encyclopedia (1905). The name occurs also as Margaliot, Margolis, Margulies. Our Margulies line descends from Menachim Menish Margolioth. Although only two children are shown on the above tree, Menachim had five sons. Our particular Margulies Family is descended from Elyakim Getzel Margolioth (1765), a brother of the famous Ephraim Zalman Margolioth (1760-1828). On the hand-drawn tree, it looks as if our line is descended directly from Ephraim Zalman. I don't know which came first here, but I suspect that Meir Faerber got his information from the same source as the person who created our hand-drawn family tree. 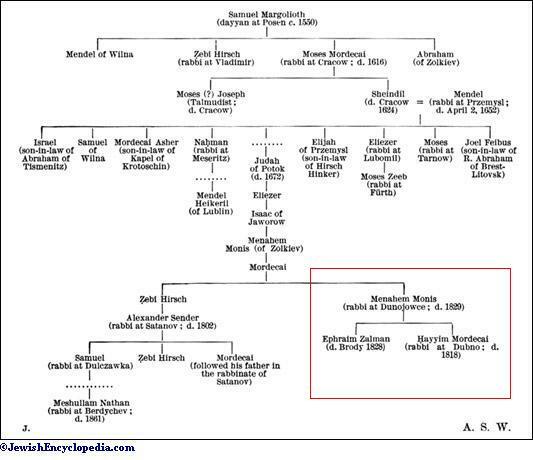 New data shows that the Elyakim Getzel Margulies (b.1827) from whom we descend is not the son of Ephraim Zalman M. (b.1760), but the grandson of another Elyakim Getzel M. (b.1765) who was Ephraim Salman's brother.